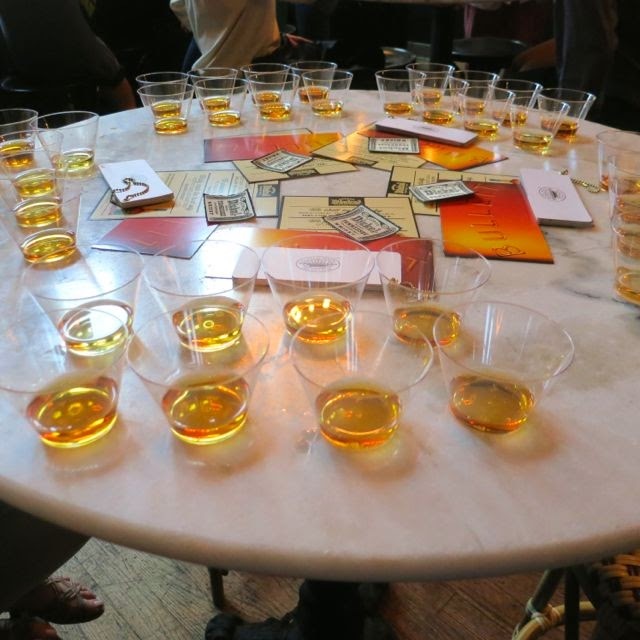 Through yet another awesome Gilt City deal, I bought tickets to a whiskey tasting class held by The Gibson. The Gibson is one of DC's premier speakeasies serving craft cocktails with housemade bitters and syrups. They hold The Gibson Lab classes at their sister bar, Marvin, because it has a much bigger space suitable for classes. So what does one do at a whiskey tasting? Well, I'll tell you. 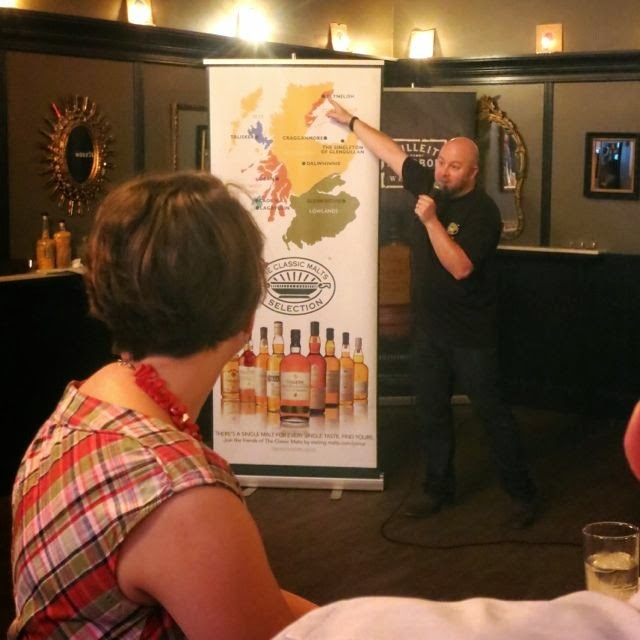 There were two instructors -- one representing whiskey from the U.S. and one representing scotch from Scotland. One of the things I like most about these classes are that they are very educational. I always learn a lot while tasting great spirits. 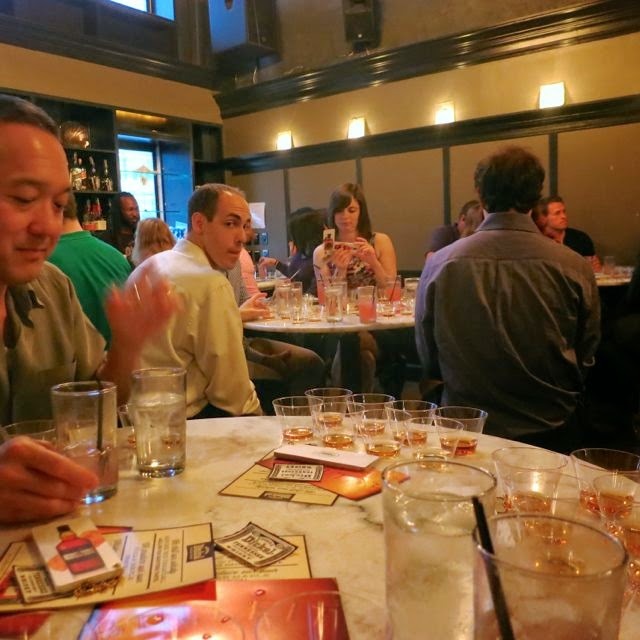 So it began with a tasting of four whiskeys from the U.S. The first was Bulleit 10, a Kentucky bourbon, made from 68% corn, 28% rye, and 4% barley. They explained to us that the mash is the mixture of grains that whiskey is made from and passed around a glass filled with the mash for each liquor. Next up was a Bulleit Rye, a Tennessee whiskey, made from 95% rye and 5% malted barley for fermentation. Then the Dickel Barrel Select, a 12-14 year old whiskey. And finally the George Dickel Rye Whiskey. I loved all of these. 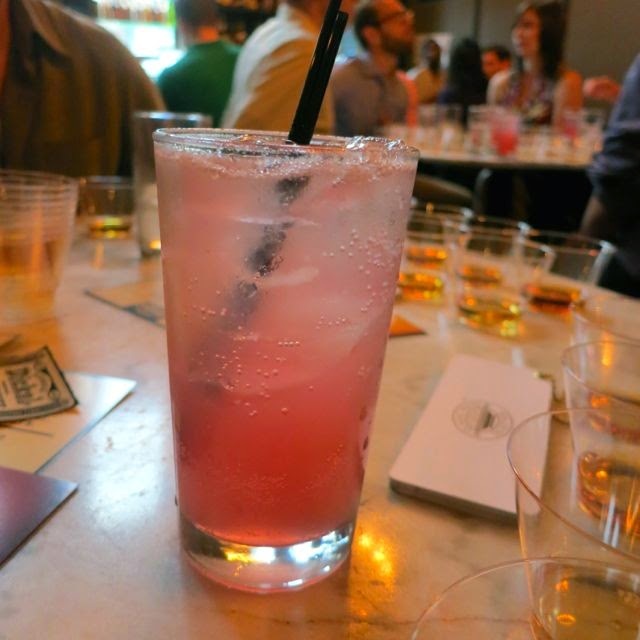 In between tastings, we got a light cocktail made with a strawberry soda, kiwi, sage, and Bickel whiskey. It was good, but a bit too light. Next, we went to the Scotchs starting with a Clynelish. Then, a 119-proof Caolila that was 14-years old. They showed us how to add a drop of water to the scotch to enhance the flavor, but advised us not to do that with anything more than 20 years old. So much to remember! We tried an 18-year old Oban and a Lagavuli Distillers Edition as well. The coolest thing was them actually lighting some peat on fire and explaining how the Scotch got its peaty taste. So, all in all, a very educational class with a lot of great whiskey. I'd just recommend they serve two cocktails next time like they did at the tequila tasting. Many of us wanted to try more.